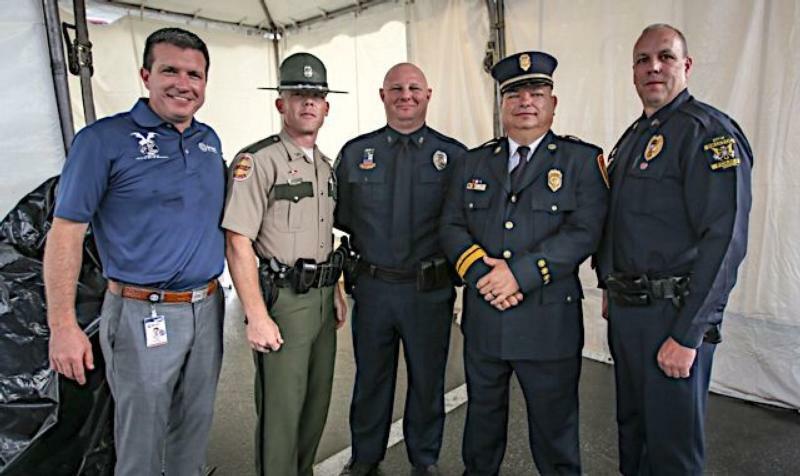 Bristol Motor Speedway honored Four Neighborhood Heroes representing first responder groups from cities throughout the region as part of pre-race festivities for Saturday's Bass Pro Shops NRA Night Race. Bristol Police Sgt. Matt Cousins, Tennessee Highway Patrol officer Russell Bernard from Nashville, Chattanooga City Fire Dept. Captain Steve Everett and Knoxville City Police Officer Jay Williams were all honored on Saturday at Bristol, with each receiving a commemorative plaque. As part of the pre-race activities, each will be also introduced to the crowd at the main trackside stage. The four also visited the infield media center where they posed for photos and met with media members. Each of the honorees was selected for going above and beyond the call of duty in their communities to make a difference in the lives of others. Leading up to the race, BMS officials traveled to each of the Neighborhood Heroes' respective neighborhoods to make the announcements. Visiting Bristol Motor Speedway for the first time, Knoxville PD Officer Williams enjoyed every part of what has been an incredible weekend. "This has just been amazing. It's been overwhelming, really," Williams said. "This place is huge. It's my first time at the track and everybody here has just been awesome. This is humbling, to say the least. I don't consider myself a hero, I was just in the right place. I've really enjoyed taking it all in." Knoxville PD Officer Williams was wounded in the shoulder after being shot by one of the TBI's most wanted criminals during a traffic stop earlier this year. He made the decision to hold his return fire at the criminal's vehicle because there was a female passenger inside and Officer Williams wasn't sure of her status. Officer Williams' initial confrontation ultimately led to the criminal's capture by other members of his department along with other local, state and federal law enforcement partners, and he was also awarded the Purple Heart. NeighborhoodHeroesBristol PD's Sgt. Cousins has worked the races at Bristol Motor Speedway for nearly two decades, but got a different viewpoint this weekend as a special honoree at the event. "It's an honor to be part of a group like this and be recognized," Cousins said. "The four of us, and everybody like ourselves don't go to our jobs looking to stand out like this. It's all just part of doing our job, and we're doing what we've been trained to do." Once on the scene, Cousins ordered the gunman to drop his weapon multiple times. The suspect then began firing upon other officers and Cousins was also hit in the leg. Cousins returned fire immediately and seriously wounded the suspect, who continued to fire his weapon as he fell to the ground. Cousins' swift actions brought an immediate resolution to the situation and saved many officers' lives and potentially many more in the community. 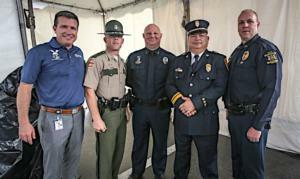 Saturday's race also marked the first time THP Officer Bernard has been to Bristol Motor Speedway, and he came away amazed by the magnitude of the historic facility and the event. "It's been great," Bernard said. "(Bristol) is a lot bigger than I expected. I'm really looking forward to the start of the race and seeing what that's like. The recognition we got, it's something we all really appreciate. It's just been a really positive experience." Chattanooga FD's Captain Everett was thrilled with his first trip to Bristol Motor Speedway as well, taking in the memorable experience with a wide smile on his face. "This has been wonderful," Everett said. "It has been such a great experience. Everybody has treated us so great and we really appreciate all the things they've done for us. It's just been wonderful."